Making Music members get a 10% discount on our course price at checkout when clicking through from the members area of the Making Music website. 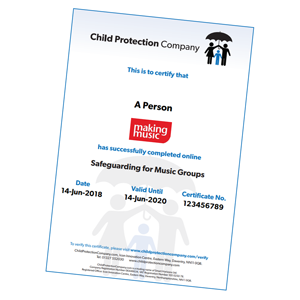 A combined adult/child safeguarding training course written specifically for music groups and developed in conjunction with Making Music, the UK’s largest membership body for leisure-time music groups. This safeguarding course will give group leaders and all those involved with running music groups peace of mind and a good understanding of their safeguarding responsibilities. A valuable tool for music groups in providing a safe environment for their members to make music in. Relevant, current and informative courses providing vital assurance to the compliance of our business. Highly recommend. The Safeguarding in Music Education course has solved our safeguarding training needs, giving us a course with relevant scenarios and an automatic management system to ensure that each employee is up to date with their training. I would thoroughly recommend this training to all colleagues. Includes both child protection and adult safeguarding. Our online learning management system has been built to solve the problem of maintaining central records for all safeguarding training and ensuring that everyone’s training is current and up-to-date. It is simple to check your organisation's records and to display a full record of training certificates. I help run a community choir, do I need to take this safeguarding course? This safeguarding course is designed for all those involved with organising and running music groups and choirs. It contains detailed modules on recognising signs of abuse and neglect and how to report concerns. Safeguarding is everyone's responsibility and this course is suitable for all adults who work or volunteer with music groups. My group often perform in elderly care homes. Is this the correct safeguarding course for me? Our online safeguarding for music groups training course has specific sections on adult safeguarding. If, as part of your music making, you come into contact with adults at risk - such as disabled, elderly, those with special needs - this course will help you to identify and report any risks and concerns should they occur. We are based in England/Wales/Scotland/Northern Ireland. Can we still take this safeguarding course? I am a music teacher working with both children and adults, is this the right course for me? If you teach children within the education system then our Safeguarding in Music Education course may be more suitable for you as it fulfils the requirements of Keeping Children Safe in Education and Ofsted. If you also teach adults at risk (vulnerable, SEN, disabled etc) then this Safeguarding for Music Groups covers safeguarding adults at risk and would be appropriate additional training for you. Final assessment can be retaken at no extra cost until pass mark is achieved. Upon successful completion of the course, you'll be able to download a personalised safeguarding training certificate valid for 2 years. This course provides an introduction to safeguarding children and adults and how that can relate specifically to music groups. It focuses on a range of safeguarding issues, including abuse and neglect, online safety and other associated areas. The content will offer guidance on how to take action in relation to safeguarding and it is suitable for anyone involved in the amateur/ leisure-time music sector. The content intersects with the aims of several areas of legislation and guidance Working Together to Safeguard Children (2018) and other key statutory and non-statutory regulation and support. It is a sad truth that child abuse, cyberbullying and child sexual exploitation and adult abuse and neglect all still commonly occur in the United Kingdom. This module will introduce you to the terminology of safeguarding and define keywords and concepts that will inform the rest of the course. Over the years, a number of pieces of legislation and guidance have been implemented to help safeguard and protect people in the United Kingdom. The purpose of this module is to provide a brief overview of just a few of the main documents and the organisations who have specific responsibilities - who you may need to contact if safeguarding concerns arise. At the end of this module, you will have an understanding that Safeguarding is everyone's responsibility and who you should report concerns to. Module 4 - What is Abuse? This module will help you to define the main types of child and adult abuse. It will then move on to consider the specific categories of abuse and their associated signs and symptoms. At the end of this module, you will have a better understanding of the signs of physical, emotional, sexual abuse, and neglect. You will also have an awareness of how to recognise if someone is being abusive or causing harm. The focus when working on safeguarding or dealing with a potential abuse scenario must be the safety of the individual. Maintaining a person-centred focus is key to the process of identification & reporting because, statistically, it is sadly the case that children/adults sometimes report issues several times before any action is taken. The learning you complete in this module will be contextualised in a realistic situation so that you can see how a ‘person-centred focus’ can be achieved. By the end of this module, you will have a better understanding of what it means to be person-centred in your approach. This part of the course builds on the work we did in earlier modules. children and adults can disclose in a number of ways, so while you want to maintain confidentiality where appropriate, you also need to know when to report and to whom. It is vital that you respond quickly and appropriately when presented with a disclosure of abuse, and this module covers the right process to follow and what to do (and what not to do) to achieve the desired outcome. You will also understand the responsibilities placed upon those who work with children, young people and adults at risk in relation to documenting decisions made and actions taken. By the end of this module, you will have a better understanding of the correct procedures to follow in response to a potential abuse situation and what to do if you have concerns about the behaviour of an adult. A step-by-step guide is included, which will help you to refer any concerns you may have. You will now take all that you have learned and apply it to an assessment of your knowledge. The final assessment is your opportunity to show how much you have absorbed and why it is so important to have safeguarding training.